Grassroots Oracle: APEX Survey Results: When did you start learning APEX? APEX Survey Results: When did you start learning APEX? Early last year I put the call out to #orclapex developers, asking them to fill out some questions in survey (using a packaged APEX application, of course). The results helped contribute to a presentation I did Kscope15. Thank you to all those who responded. I thought I'd finally post some results, see if it can elicit further discussion, even of a casual nature. Some of you asked me if I could post these results, so thanks for your patience and stay tuned on the 2015 Survey label in this blog. I'll aim for every Friday. Now it must be said: this is an internet survey. It's not randomised and it's no doubt highly skewed towards the developer population that either read my blog or use Twitter. And even then it's only those who chose to spend the 10 minutes responding. Based on the free text responses I doubt it was gamed (unlike other polls), no surprises there. When I closed the survey I had 192 responses, of course far shorter than the number of APEX developers out there, quietly coding away. Everyone, feel free to add your own thoughts to some of these results. It could be insightful and fun! Q1: When did you start using APEX? 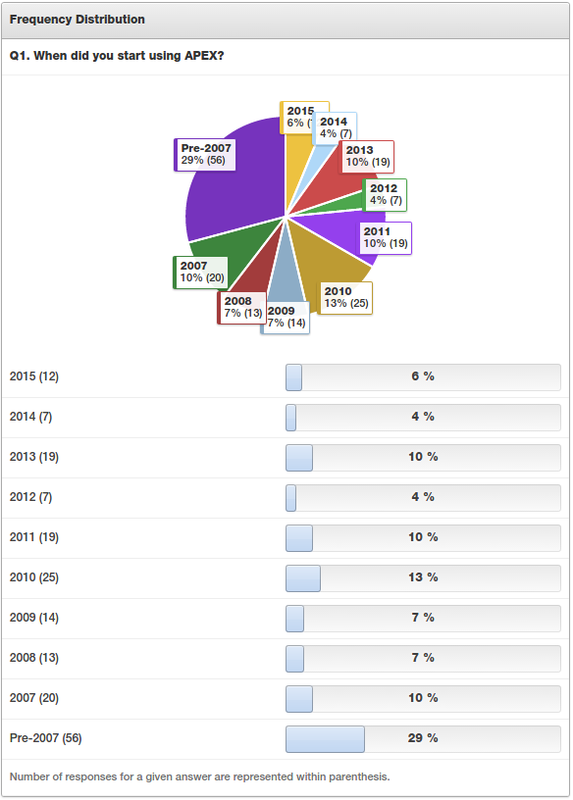 I was surprised there are so many respondents prior to 2007. Maybe this is a reflection of the demographic that chose to respond? I started learning in 2008, with some experience with mod_plsql and heavy with Forms experience. I found it tough learning session state, and ultimately designing page flow in a web environment. As others have mentioned, there have been a few features that I would have loved to have found earlier. My real kicker was Region Display Selectors. What I'd like to know is, what made you start learning APEX? For me, I realised Forms was dying. Awareness of Apex only started to rise around 2004-2005, so your last bucket is 3 years wide; so it seems to me the distribution of your sample size is suprisingly uniform. That's a fair point, I remember being conflicted in regard to where to draw the line.